One of my Search Engine Optimization (SEO) clients recently asked me if sitemaps helped with SEO. So I thought I would explain what sitemaps are, and why they important. A sitemap (or site map) is a list of pages of a website, a way of organizing a website to help visitors and search engine bots find pages on the site. The sitemap identifies the pages and the data under each section which is typically organized in a hierarchical fashion. The sitemap enables the four biggest search engines Bing, Yahoo, Ask, and Google to have uniform and updated page information. Sitemaps do not guarantee that all links on the website will be crawled, and being crawled does not guarantee the search engines will index, or process all your information. 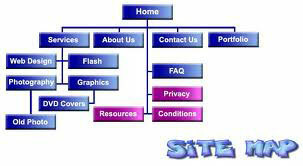 However, a sitemap is still the best way of getting the search engines to learn about your entire site. Sitemaps are not a tool for search engine optimization. They do not affect your website ranking, but they do allow the search engines to make more accurate rankings and searches of your website by providing the data that a search engine needs, in a format that makes it easy to find. To check to see if you have a functioning sitemap you can check out the sitemap validator. If you do not already have a sitemap you can use the free sitemap generator. To learn more about getting a sitemap running on your website cal Wayne at 781-325-8186 or fill out the Contact Us form. Previous PostHow To Decide on a Career or Job ChangeNext PostIs Direct Mail the Best Marketing Strategy for Small Business?